Ponza has been my favorite hide away for the last 20 years. You know, the kind of place you’ll want to keep secret, but you just can’t help to tell. 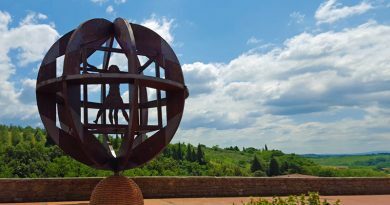 A favorite summer escape for both nature lovers, divers, Italian food lovers, and the Roman and Neapolitan bella gente, but that is still relatively off the beaten tourist track. 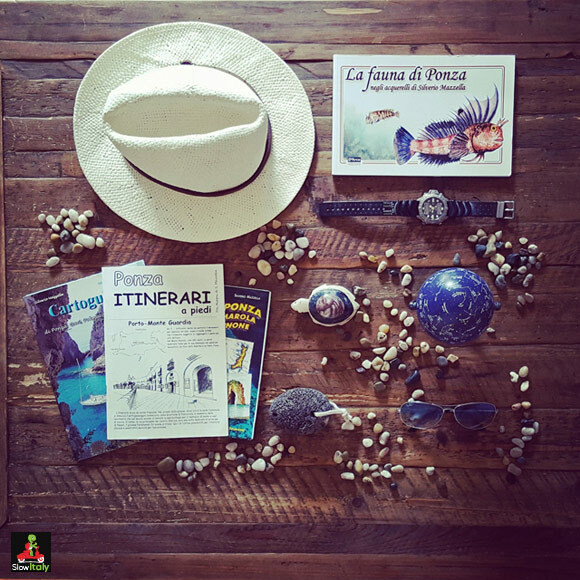 The perfect mix between slow and chic: unspoiled nature, crystal clear waters, excellent food, family-run hotels with stunning views, and a fisher men’s island that is still authentic and true to its character. 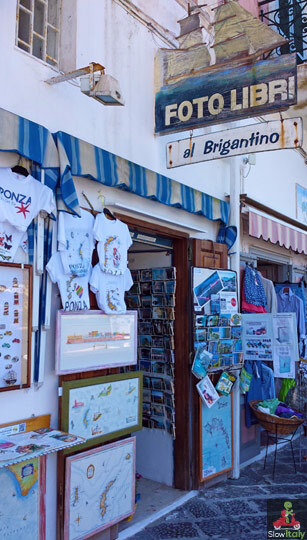 A photographer’s paradise, where the local people, seasonal inhabitants, habitués and the right amount of visitors perfectly mingle together sharing the island’s slow pace and laid back atmosphere. 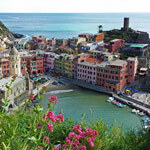 The kind of place where you can still get a glimpse of authentic Italian hospitality and (slow) island living. 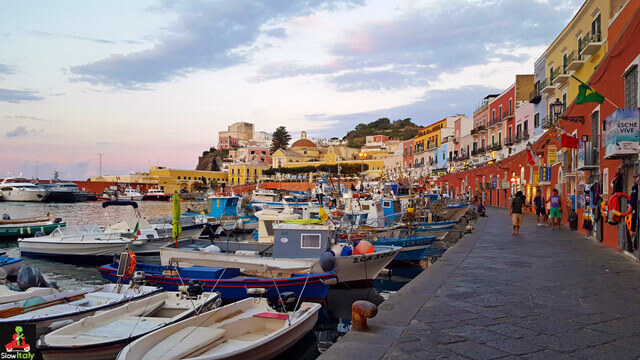 The charming, little island lies between the Circeo Promontory and Ischia, in one of the most beautiful parts of the Mediterranean. 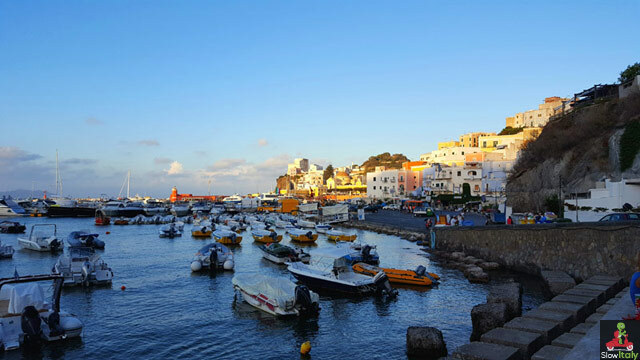 Although belonging administratively to the Lazio region, the island is located closer to the coast of the Campania region. 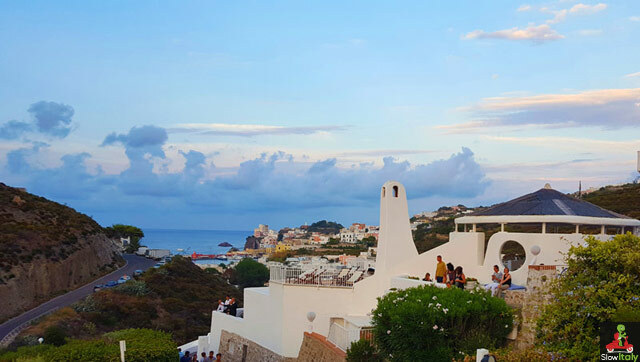 Ponza is a true miracle: a closely-knit island that has managed to stay virtually intact despite the fact that it is only about sixty miles from Italy’s capital Rome. As it has no airport and is only accessible by boat, it has been relatively well preserved and unblemished by mass tourism. While the port and center of the island are accessible by ferry and boat, most of the small, rocky beaches are only reachable by sea, requiring a small motor or rubber boat, as the larger sail boats and yachts need to remain at a reasonable safety distance due to the presence of sandbanks and rocks. The wisdom of the inhabitants of Ponza has done the rest. 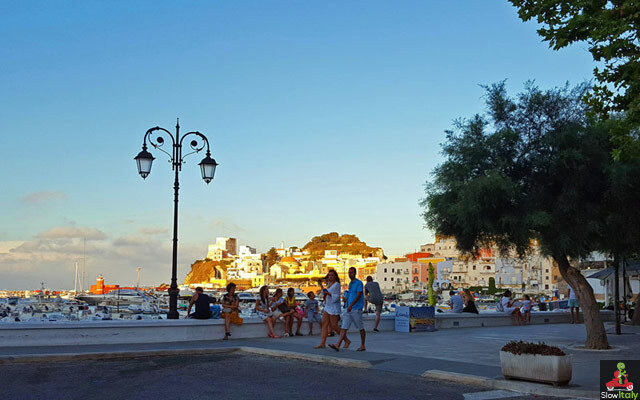 The picturesque, little port, surrounded by a semi-circle of typical cheerily painted houses, boasts a few restaurants, cafés and small boutiques that line up along the central promenade facing the sea. 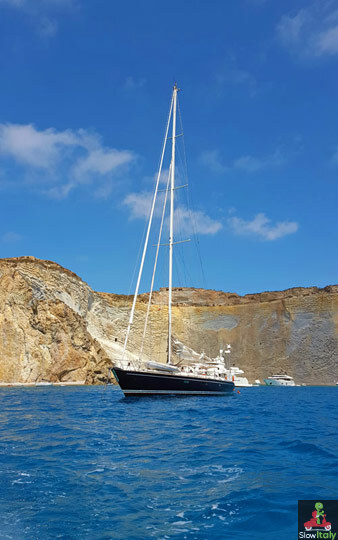 While Ponza may have an upscale feel about it due to the presence of impressive yachts dropping anchor around the island, the island’s style is resolutely casual and relaxed. 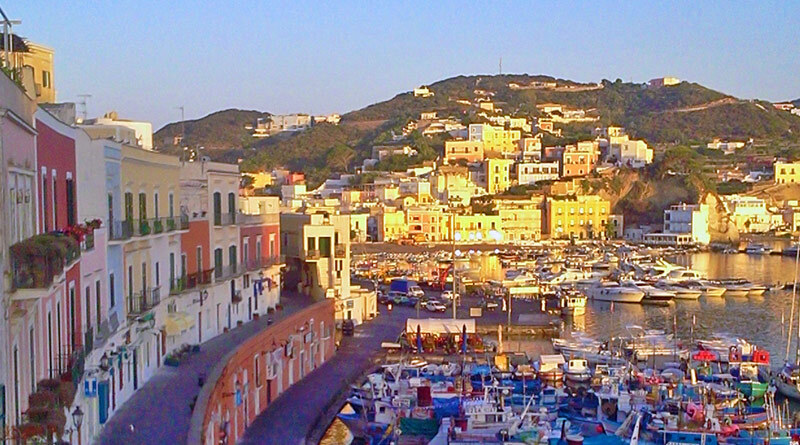 Visitors to the island remain discrete, appreciating the peace and anonymity they can find on Ponza like nowhere else. 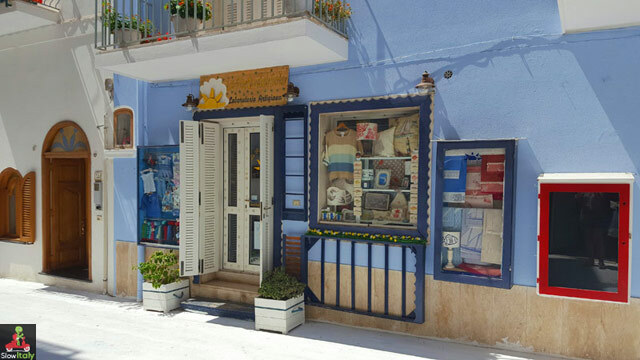 You will find a few shops selling clothes, shoes and jewelry in the typical Pontine style, a few bars and family-run hotels, but you’ll find no 5-star hotels, nor high-end luxury shops here. And that’s a good thing. The only exception are a Michelin-starred restaurant (see further) and a few other excellent restaurants, but even here the atmosphere is definitely more laid back than in comparable restaurants on the mainland and you can feel that this is how the Ponzese people want to keep it. 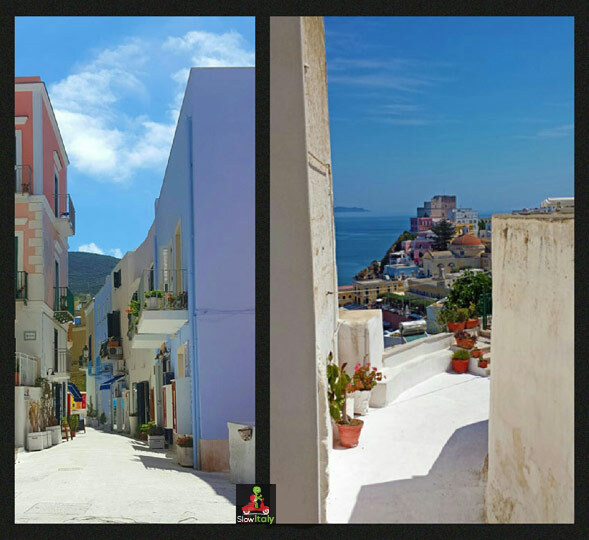 To get what you want, you have to deserve what you want, is what best summarizes the island of Ponza, but what you’ll get there you find nowhere else. 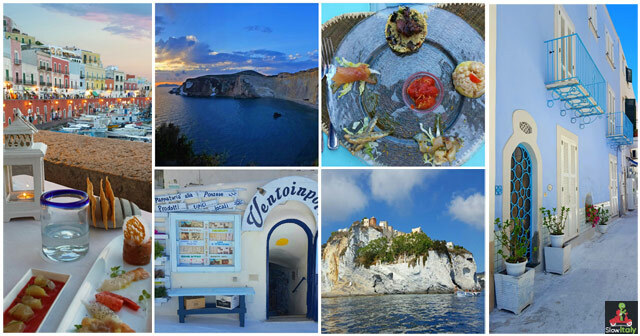 Restaurant Acqua Pazza, Ponza. Photo © Slow Italy. 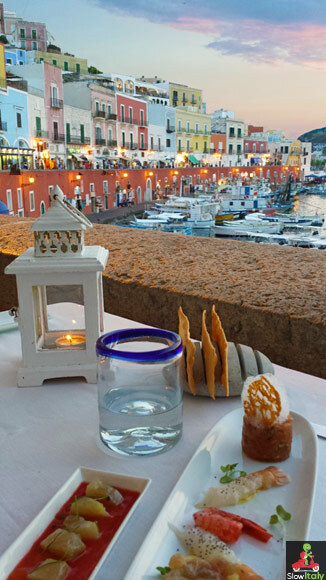 One of Ponza’s iconic restaurants is Acqua Pazza on the port-side promenade. It is here that the famous Acqua Pazza preparation (a delicious sauce combining fresh tomatoes, capers and olives, now famous all over Italy) was invented. Another of our favorite dishes (not on the menu,) is the Spaghetti alle uova di ricci. Absolutely worth trying is also their antipasti crudi, an exquisite dish of tartare and refined raw fish bites. 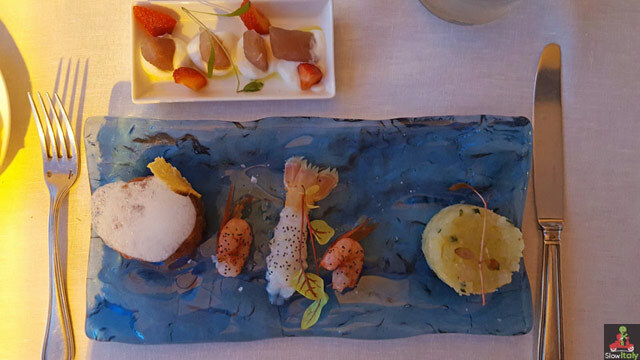 Ristorante Acqua Pazza. Photo © Slow Italy. 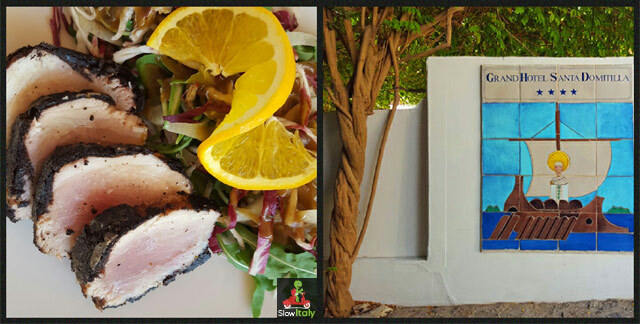 Almost next door is another iconic restaurant of the island, l’Aragosta. 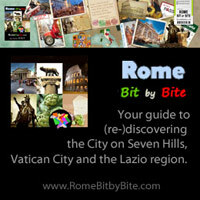 Try their carbonara di mare or their delicious spaghetti alle vongole. The owner takes pride in his pasta, which is indeed cooked al dente to perfection! The restaurant takes no reservations so arrive early. 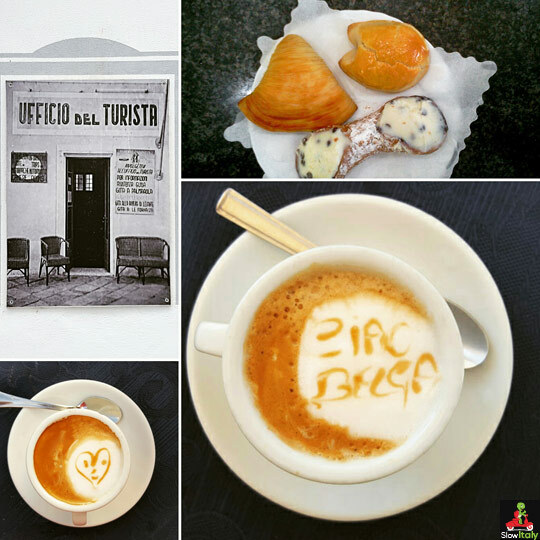 If you feel like having a ride around the island (see further) I recommend a gastronomic pitstop at Da Ciro ristorante Miramare in Le Forma, on the other side of the island. 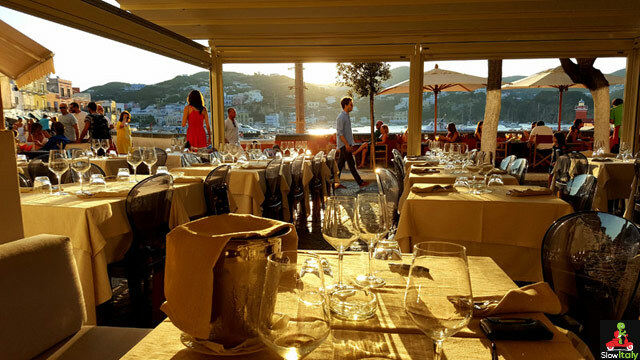 Da Ciro is the island’s only restaurant where you can see the most dazzling sunset over the Pontine sea from your table. 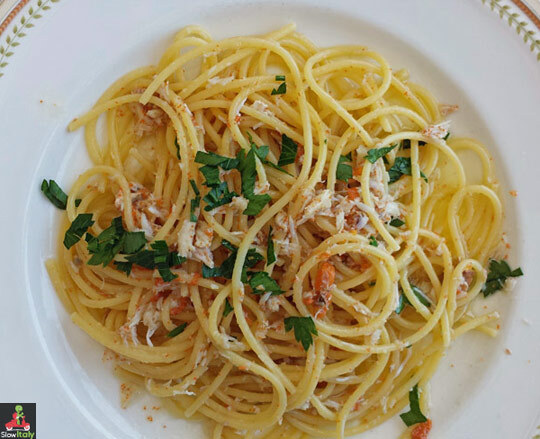 Their pasta con granseola (spider crab) is to die for, freshly fished and prepared on order (only available in the months April, May and beginning of June). Due to its volcanic origin, the island is adorned with spectacular natural sights: blue caves, beautiful coves, amazing sea stacks and rocks, white and blue-grey cliffs that drop abruptly into the sea and gorgeous beaches, all surrounded by emerald and turquoise-colored, crystal clear waters. The unique, breathtaking scenery and nature is best admired from the sea, both above and underwater. 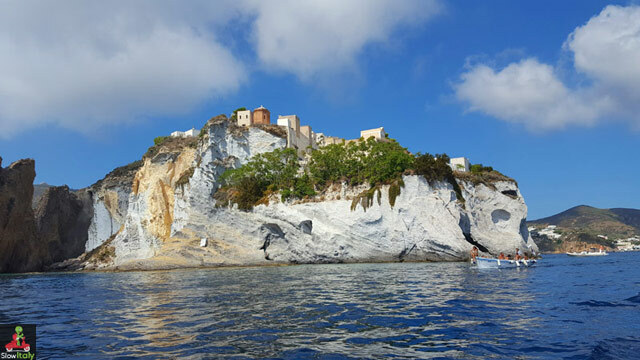 There is also the Core, a portion of the rock in the shape of wounded heart, dripping blood, subject to the most daring legendary interpretations, and Capo Bianco, home of the peregrine falcon. Struck by the beauty and peculiarity of the place, the Italian director Federico Fellini decided to shoot a few scenes of his film Satyricon here. 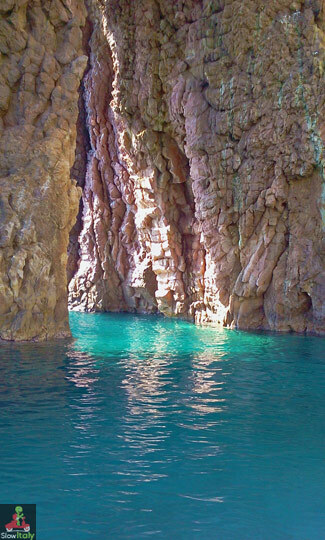 Among the many other natural sights are Cala Feola and the Piscine Naturali, Cala Fonte, the Faraglioni del Calzone Muto, Grotta del Corallo, Orecchio Giallo, Punta Incenso and the Scoglio dello Spumante. 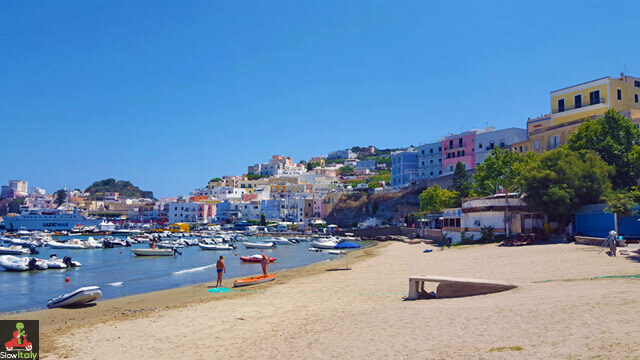 And last but not least, the island boasts some beautiful stretches of beach such as Frontone, Lucia Rosa, Schiavone and Felci and, of course, the most scenic of them all, Chiaia di Luna, a narrow beach of silky sand at the base of a skyscrapping white golden rock wall in half moon shape (hence its name). At night the atmosphere on the port-side promenade is just magical. Whether you have a drink or an after dinner ice cream or just come down for a walk, take the time to enjoy the amazing ambiance and outrageous sunset. 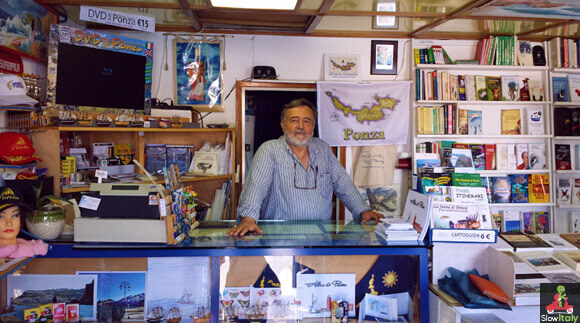 Don’t skip a visit to the island’s only bookshop Il Brigantino, run by Silverio Mazzella, a cartographer, photographer, researcher and book illustrator, who among many other interesting works, has published a beautiful book about the fauna of Ponza, illustrated with his awesome true-to-life acquarelles. 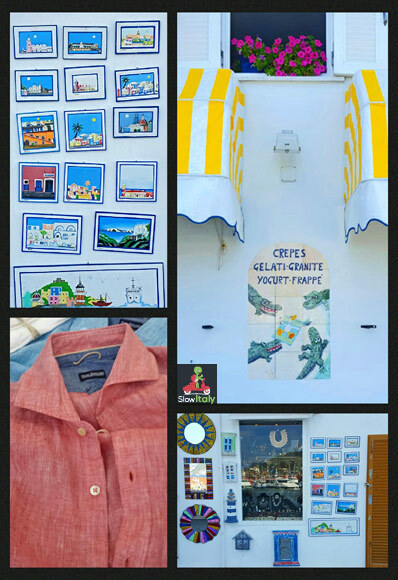 For fashion shopping in the local Ponza-style head to Brezza di Mare run by an adorable young couple, Saverio and his wife Tiziana, from Naples. Their city of origin is famous for its artisan tailors, so it comes as no surprise that you’ll find some of the best fine linen and cotton shirts in their little boutique. Almost next door is a shop selling cute armbands, earrings and neck laces, and a gelato parlor open until late at night. One of the best ways to admire some of the island’s most wonderful sights is by renting a boat and touring the island. You can rent a small boat from one of the boat rentals at the port (going down the stairs at bar Maga Circe) or from Diva Luna, at the beach on the right of Hotel Gennarino a Mare. It will cost you between 50 and 220 euro/day, depending on the type of boat and motor (you will be charged for petrol separately). No license is needed, but please respect the recommendations you will be given, as the sea can be very tricky and change abruptly within a couple of hours. Depending on the sea and winds the owner will tell you whether it is preferable to tour clockwise or counterclockwise around the island and whether it is safe to tour all around the island or if that day it is best not to go beyond a certain point. Also please respect speed limitations when approaching the coast and otherwise remain at a safety distance from the coast in order to avoid rocks. Take some drinks and food and organize a delicious picnic at sea, but please (please!) bring all waste back with you and do not throw anything into the sea (not even things that you assume are biodegradable). 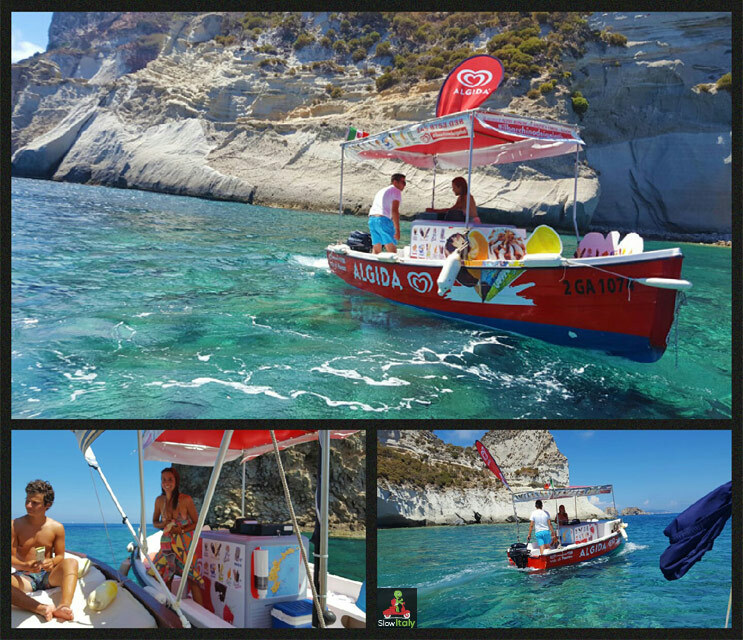 This year we discovered something new: a colorful and curious little boat, selling ice cream at sea! Of course, we had to try this! So we hailed them, and I must say they were really clever at manoeuvering their boat to stabilize it alongside ours. A welcome surprise when it’s hot and you are far from the shore. 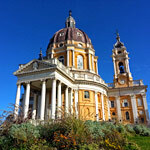 This is Italy ! Renting jeep for a few hours (the island is otherwise mostly car-free, apart from the small local Ape) is another way to discover some more secluded places of the island. 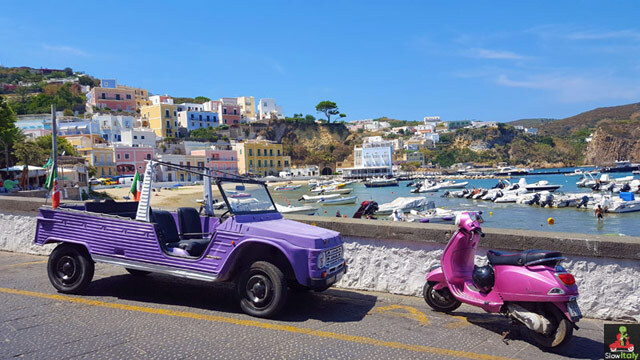 Rent a Mehari jeep or buggy at Noleggio Agostino Pilato (right after the pedestrian tunnel on the main street) and have a ride to Le Forma on the other side of the island (see 3.) Count about 35 euro for 4 hours (20 for the first hour and 5 euro for each additional hour. Petrol is included in the price). 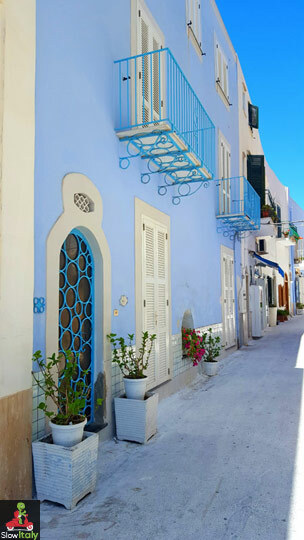 If you like to discover the little maze of streets on your own to make spotless photographs, the best time is around lunch time, when most people are either at the beach or out on the sea. 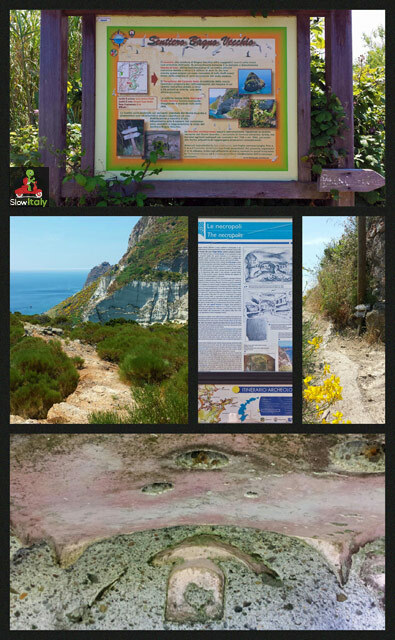 If you decide to venture up to the “forgotten” ancient Roman necropolis of Ponza, I recommend you buy the small brochure-book Ponza Itinerari a piedi which will guide you along the path that is most of the time very well indicated with information boards, but lacking signs on some portions. The tombs are excavated in the friable rock. They are proof that the island was settled by the Romans during the Republican era, as these hypogram structures were used to until the end of the 4th century AD. The first necropolis is located on top of the rocks that dominate the inlet of Chiaia di Luna. The second can be found on the eastern slopes of Monte Guardia at Bagno Vecchio. 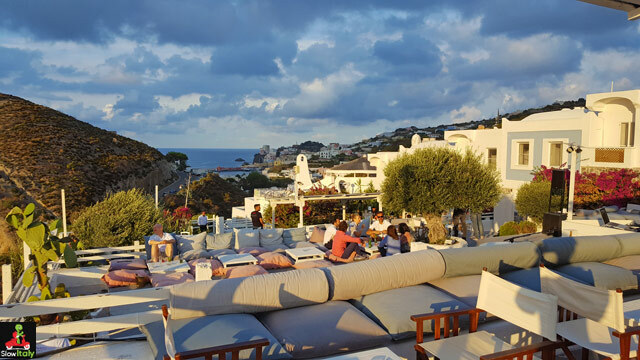 One of the most scenic terraces of the island and maybe of Italy, is the terrace of Hotel Chiaia di Luna. Every evening during summer entertainment is provided at the Ki Bar piano and lounge bar overlooking the spectacular bay. You can enjoy the view while sipping a refreshing cocktail and for a small supplement you can enjoy the dinner buffet. 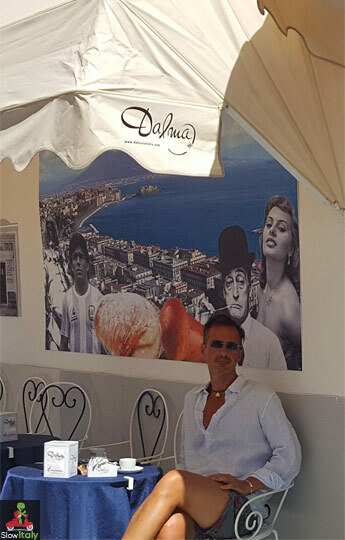 For breakfast or a coffee break head to the Pasticceria Caffetteria Napoletana on the small, bustling main street in the center of Ponza. They have the most delicious sfogliatelle (ricce AND lisce), wonderful cannoli and other totally yummy pastries. 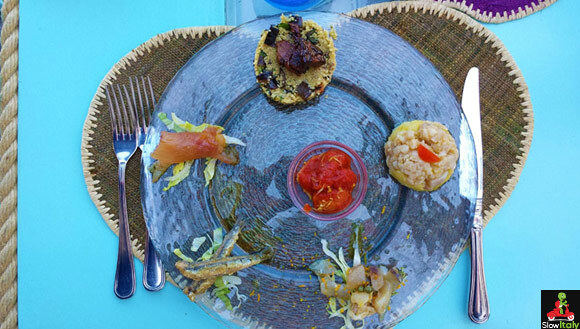 Try the antipasti misti of raw fish and pair it with a local wine from Ponza or a Pecorino from Abruzzo (which is excellent with fish-based pasta or raw fish dishes). 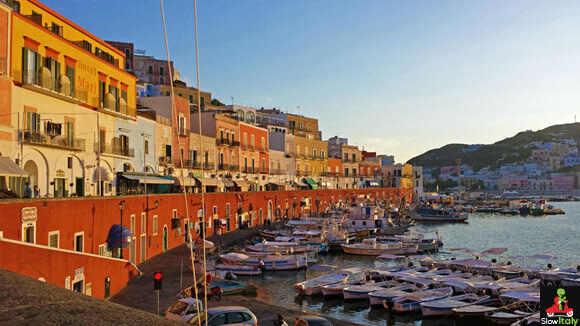 Actually, Ponza is part of the Pontine archipelago which consists of six islands: Ponza, Palmarola, Zannone, Gavi, Ventotene and Santo Stefano. All islands are of volcanic origin, except Zannone which has sedimentary and metamorphic rocks. 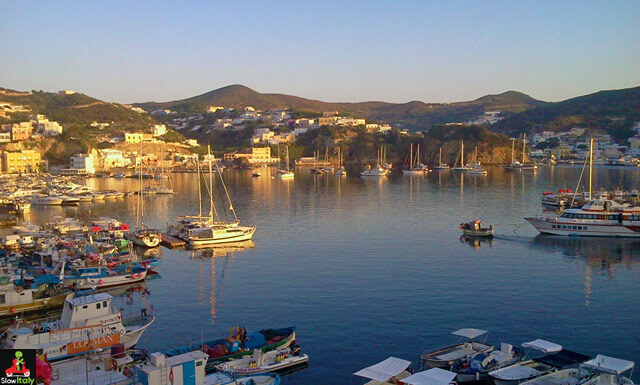 Only Ponza and Ventotne are large enough to offer accommodation possibilities and regular ferry connections. The other islands can be visited by boat from the larger islands. 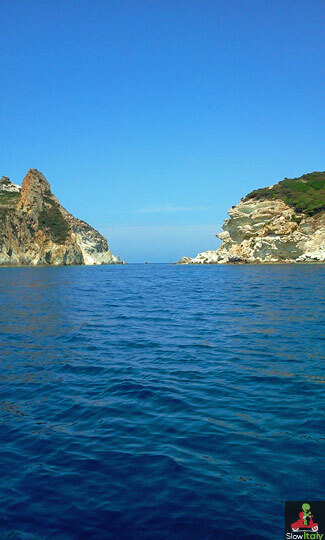 Palmarola and Zannone are classic day trips from Ponza, each just 30 minutes away by motor boat. To the west, Palmarola is a protected nature reserve, particularly popular among divers. Its turquoise seas and splendid coves can compete with those of islands in the South Pacific or the Caribbean. 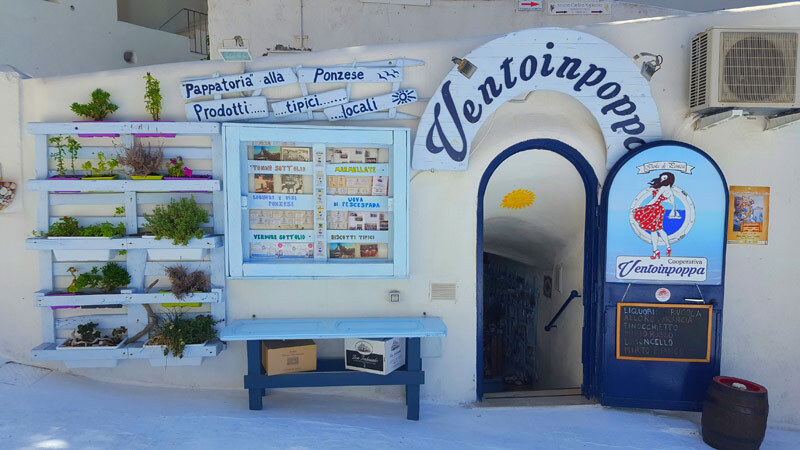 There is a small, low key fish restaurant on Palmarola that is accessible only by boat. 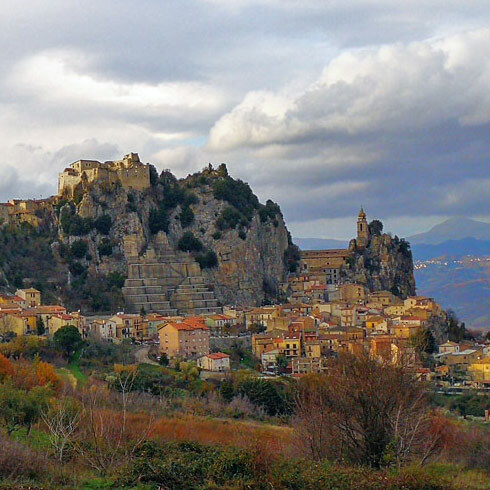 To the northeast, Zannone is a nature reserve with quiet hikes, dense forests, and wild sheep running free. 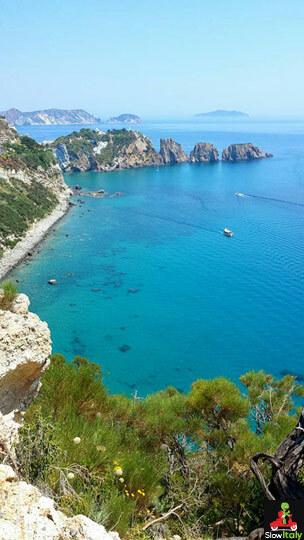 Some of the animal species and subspecies found on Ponza are endemic to the island, which means that they can be found only here and nowhere else on Earth. Hipparchia sbordonii (Ponza grayling) from the book “La Fauna di Ponza” researched and illustrated by Silverio Mazzella. 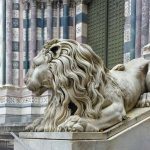 D’Arco Edizioni: 2015. One example is the butterfly Hipparchia sbordonii (Ponza grayling) that is only found on Ponza and the Faraglione della Madonna. Actually it was first called Hipparchia of Ponza, by O. Kudrna Leigheb, the naturalist who studied it in 1984. Other endemic species include the scorpion Euscorpius carpathicus Palmarolae, found only on the island of Palmarola. 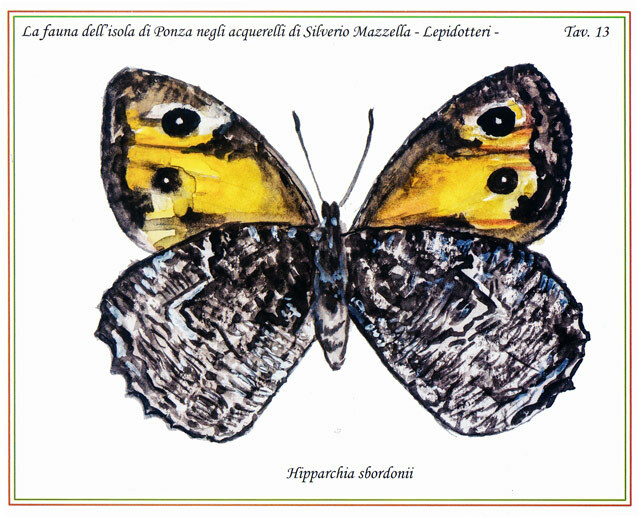 From the book “La Fauna di Ponza” researched and illustrated by Silverio Mazzella. D’Arco Edizioni: 2015. 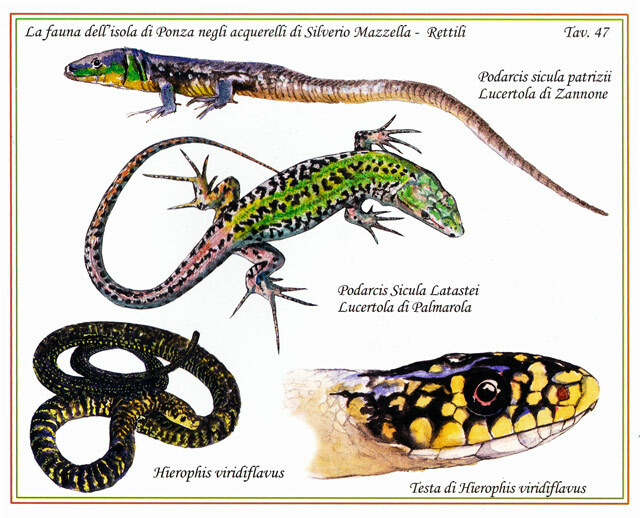 Even the class of reptiles includes some species that are only found on the pontine islands, such as Podarcis siculus latastei or Palmarola Wall Lizard and Podarcis siculus patrizii (Zannone lizard). This ponzesità (the quality of being specific to Ponza) can also be found in the vegetal world. On the rocky slopes , near the coast, grows the Limonium Pontium a plant with delicate, violet-colored flowers. 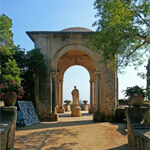 Part of the island’s fascination also stems from its unusual history. Taking advantage of the island’s isolation various regimes used it as a penal settlement. 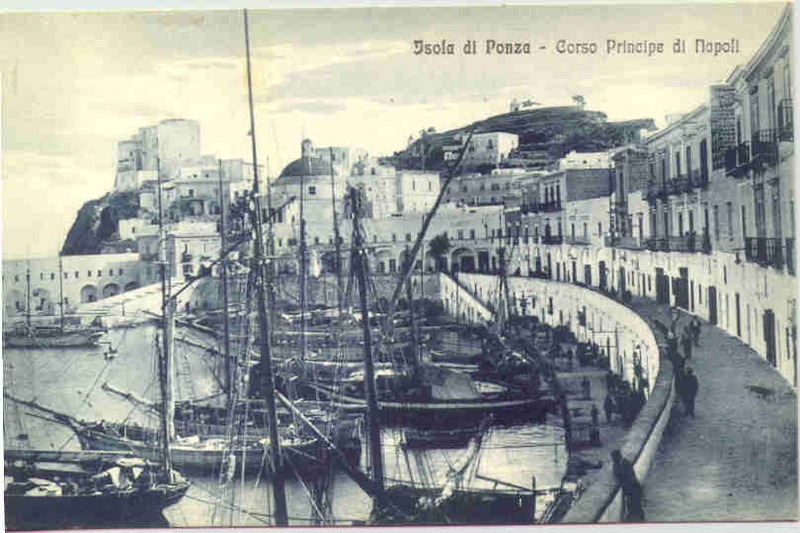 During the two decades of fascism, Ponza and the nearby Ventotene, served as a prison for political opponents of Benito Mussolini’s regime. Mussolini himself was imprisoned on the island for several weeks after being overthrown and arrested in 1943. The island was already inhabited in neolithic times, as proven by findings made in the XXth century which have provided strong evidence for the working of obsidian stone. 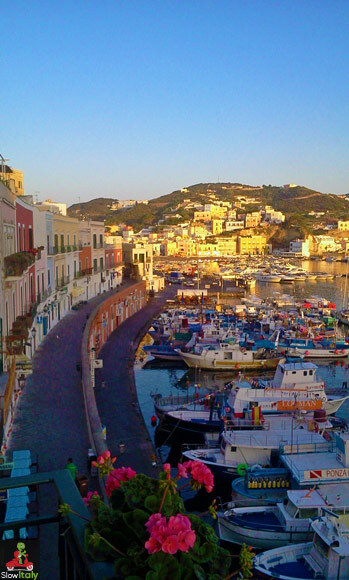 Like other Mediterranean islands, Ponza suffered successive waves of invasion. First colonized by the Etruscans, Phoenicians, Spanish and Greeks, among others, it was abandoned during the Middle Ages due to constant raids by Saracens and pirates. 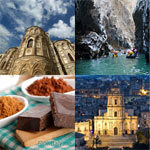 Re-colonized by the Kingdom of Naples during the 18th century, the island became part of the Kingdom of Italy in the mid-19th century, later transformed into the Republic of Italy. The Greek gave it the name Eea, while the Volsci called it Pontia. Various theories have emerged to explain the etymology of the name. According to some sources the island was named after Pontius Pilate, but there is no evidence to support this theory. Othe sources believe the name stems from the Greek term Pontos (land of sea), but more recents studies indicate that it could be the latin translation of the Greek term Pénte – Nèsoi (five islands), referring to the number of islands that make up the Pontine archipelago (but they are in fact six). The most recent hypothesis is that the ancient Greeks named it after the goddess Aphrodite. Aphrodite had various cult titles and divine functions, among which Pontia, a title referring to her function as the protectress of sea voyages and sea people. 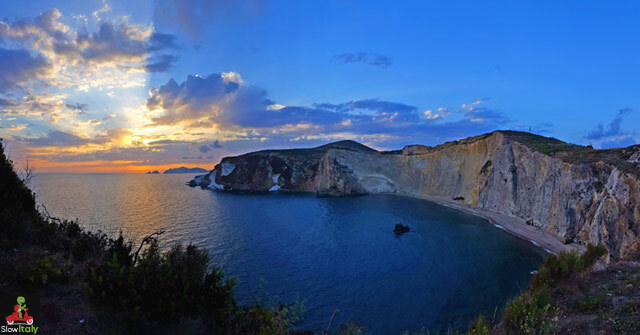 Evidence to support this theory is that Ponza’s neighboring island Ventoten was originally called Pandataria, coined on Pandemos, another of Aphordite’s many titles. 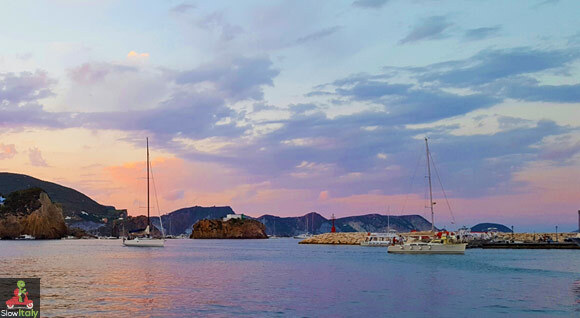 The best time to visit Ponza are the months May, June, September, and the beginning of July, avoiding August as the island can become pretty crowded by day-tourists flocking from Rome and Formia. 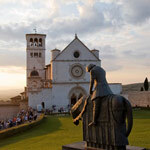 If you plan to go in July it is best to avoid the week-ends, planning your stay anywhere from Tuesday to Friday. We recommend spending a minimum of two nights and three days to have enough time to visit the island both from the inside and from the sea. 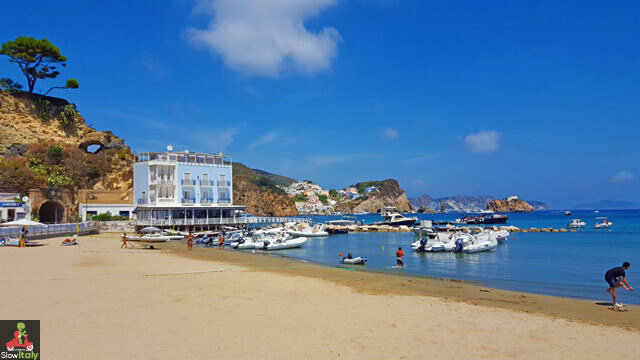 I have been going to Ponza at least once a year for the past 20 years and have stayed in various types of accommodation: rented rooms, B&Bs, “budget” hotels and more upscale hotels. Until a few years back I preferred to stay in a B&B, like Villa Ersilia, as I found that the hotels’ infrastructure had not kept up with the rooms rates asked. 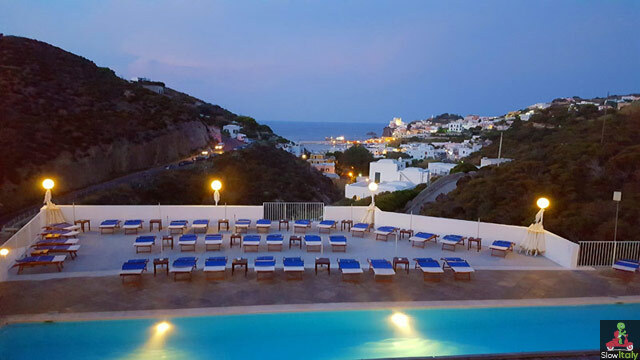 However, in the past three years I’ve been going back to one of the iconic hotels of the island, Grand Hotel Chiaia di Luna, where the younger generation has done a great job to renovate the premises and bring them up to standard. I must add that most hotels on the island are still run by the original families, which in my eyes is a very good thing, but which also means that renovations and improvements to keep up-to-date with requirements of international travelers are done at a slow pace. But that is also what makes the charm of the island. 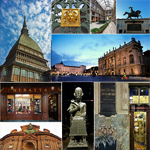 In the range of Chiaia di Luna, there is also Santa Domitilla. Both hotels have a swimming pool, beautiful outdoor areas where to relax and a state-of-the-art restaurant. Santa Domitilla also has a nice spa with cold and hot water grottos. 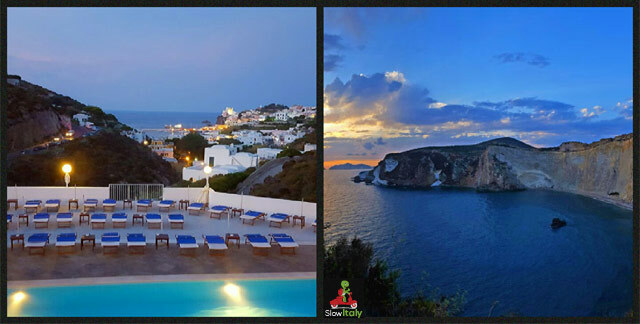 Chiaia di Luna is unbeatable for the view over the eponymous bay. 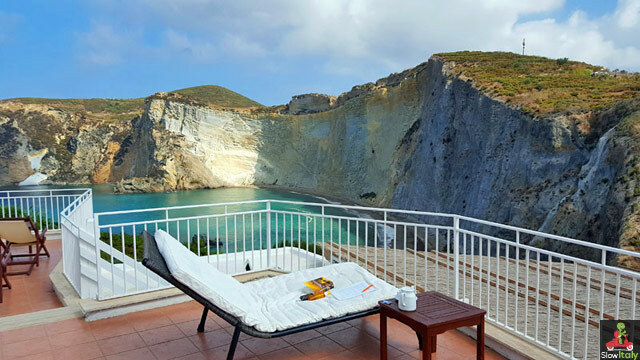 For those of you who want to stay right in the center (and pay a little less), there is Hotel Mari, with its balconies overlooking the promenade (the first photo on this page was taken from the balcony of Hotel Mari). If you prefer to stay in a B&B, I recommend Villa Ersilia for their lovely terrace with a lovely view, but be aware that their beds are a bit spartian. 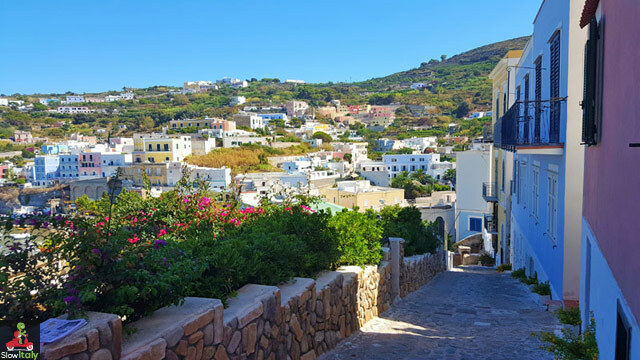 😉 In recent years a lot of new B&Bs have popped up that I haven’t tried yet, so you may want to have a look at everything that’s on offer using the search box below (it’s preset for Ponza). Access from Anzio by aliscafo (hydrofoil, 1hr10) and Formia by ferry (2hr30) and aliscafo (1hr10) or from Terracina (ferry 2hrs). There used to be a ferry departing also from Anzio but it doesn’t operate anymore. I always travel from Anzio. 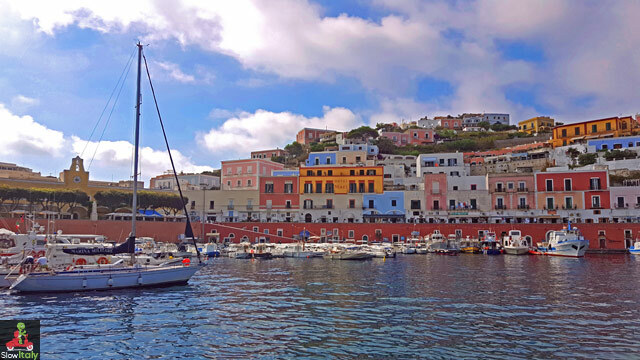 Once in Ponza you may want to rent a small motorboat to explore the coast around the island as well as the other pontine islands. We usually rent from Diva Luna (www.divaluna.com), one of the longest running boat rentals of the island, with a wide fleet (from 15hp to 250hp) and competitive prices. It will cost you about 50 to 120 euro/day for a smaller boat and 220 to 300 euro/day for a more powerful boat, depending also on the season (you will be charged for petrol separately). 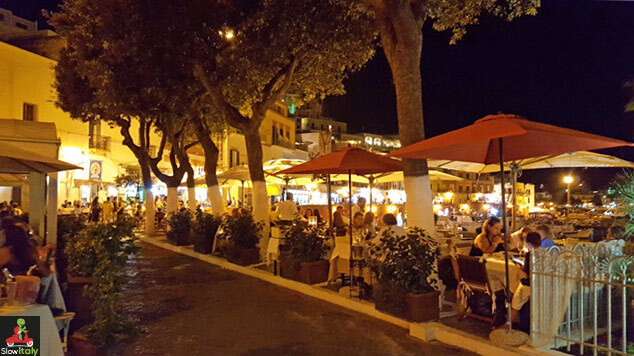 You’ll find Diva Luna right on the beach, on the right of Hotel Gennarino a Mare. 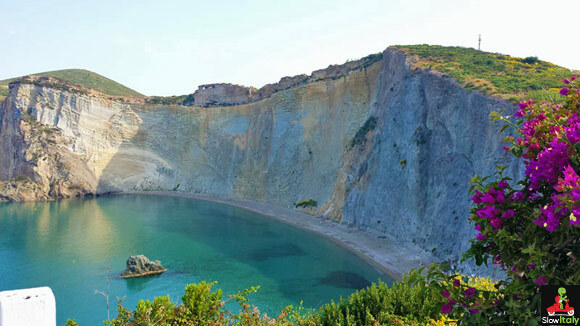 Another option is to rent a sail boat or small yacht for your trip to Ponza and your stay there. 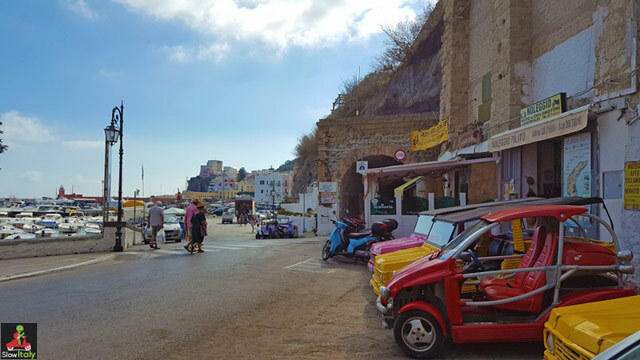 To tour around the island you can rent a Mehari jeep, buggy or scooter in the center of Ponza (just past the pedestrian tunnel on the promenade). 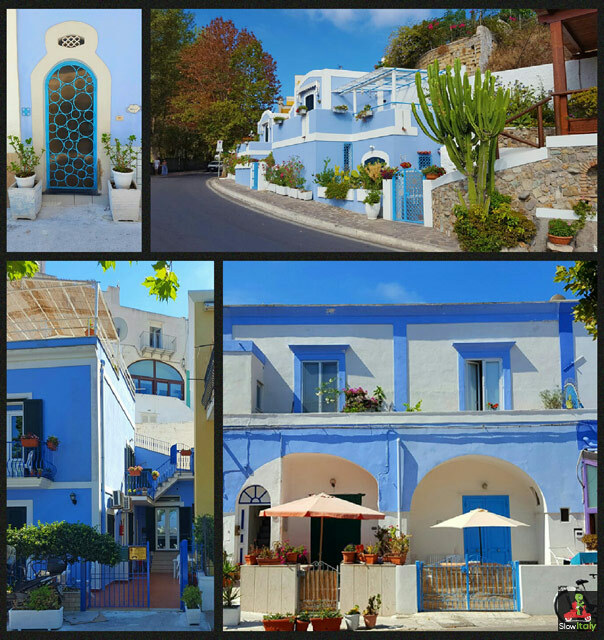 For additional practical info, see our earlier post on Ponza. 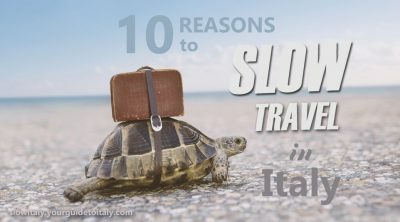 Photo credits: all photos © Slow Italy, except history post card. 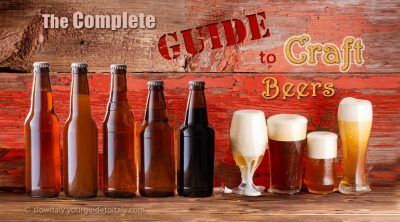 An earlier and shorter version of this article by the same author was published on Yourguidetoitaly.com on July 4, 2007.